It is our commitment to provide the best nutrition for your feline family member. Cats are carnivores. Our complete formulae provide excellent protein levels and animal origin ingredients to satisfy picky cats. We combined the best elements of protein sources in this exceptional formula. We chose to blend the highly digestible amino-acid rich chicken with the nutritious and delicious combination of 6 fish from the oceans of the world. Every ingredient has been cautiously chosen for its range of nutrients that work synergistically to support well-being. All AVP formulae are completely natural with added vitamins and minerals. No synthetic preservatives are added. Not only is our food expertly formulated to deliver the best in nutrition, but it is also a tasty delight. Your cats will love and devour every day. Balanced nutrition for Kittens, Adult and Senior Cats. Fully support four stages of life - gestation, lactation, growth, and maintenance. 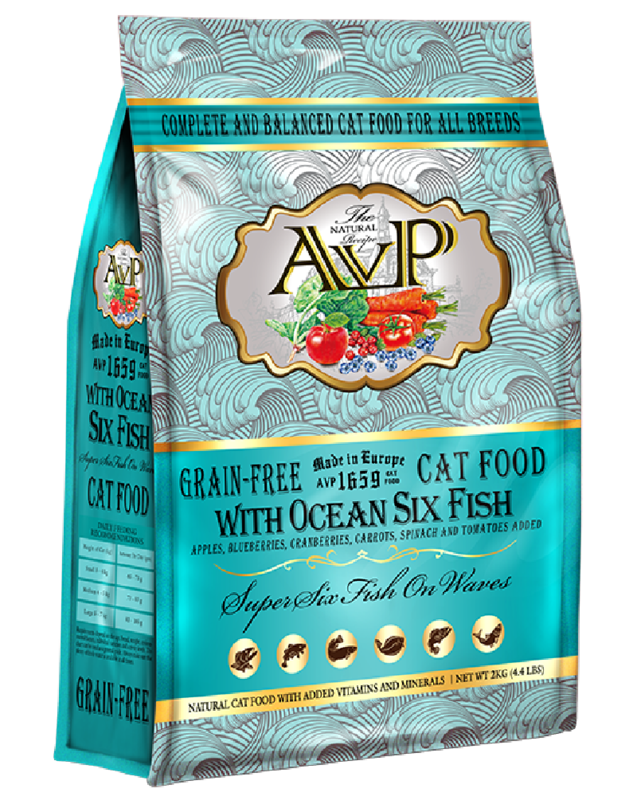 AVP®1659 Super Six Fish on Waves™ with Ocean Six Fish Grain-Free Cat Food is formulated to meet the nutritional levels established by the AAFCO Cat Food Nutrient Profiles for all life stages. AVP® only pick the best farmers and ranchers who raise their animals without antibiotics and synthetic hormones from all over Europe. Our vegetables grown in healthy soil and healthy livestock from farm in Europe. Ingredients: Chicken, Peas, Lentils, Sweet Potatoes, Fish (Salmon, Cod, Pollock, Herring, Redfish, Plaice), Chicken Fat, Potato Flakes, Salmon Oil, Brewer’s Yeast, Hydrolyzed Chicken Protein, Flaxseed, Chicory Pulp, Apples, Carrots, Cellulose, Vitamins and Minerals, Blueberries, Cranberries, Tomatoes, Spinach, Yucca Schidigera, Rosemary Extract. Requirements depend on the age, breed, body weight, environmental factors, individual variation and activity levels. This chart can be used as a general guide. Always make sure that plenty of fresh water is available at all times. Copyright© AVP® is a registered trademark in EU which owned by the "Whiskbo Breckenridge Co. Ltd." in UK. All rights reserved.